Experience the views, the sunsets and the convenience to Santa Fe's sights. Located at an elevation of nearly 7,000 feet with quiet serenity. Minutes from the Historic Santa Fe Plaza, restaurants and shops. Viva Santa Fe! About 8 miles south of Santa Fe Plaza, Santa Fe Skies RV Park is an interesting place to spend a few days and see the very cool local sights. The main drive in is paved, but the rest of the roads and sites are dirt/clay. Main group of sites are up on the top of the hill near the office and are typical slanted side by side pull-thrus. The rest of the sites, and the one we were assigned are scattered down the hill to the east in what they call the Yucca Zone on a maze of side roads. Truly need a map to navigate and some of the turns are tight. Odd layout and our pull thru was curved around a terrace wall which required quite a bit of back and forth to get the rig close to the concrete patio (a must as the ground turns to sticky red mud when it rains. Utilities works fine, good power, water pressure. Cable available, but no trees to block satellite reception. Very nice view of the NM high dessert. The Yucca sites are spaced nicely giving a bit of room and privacy. Only bathhouse is at the office, which meant the Yucca folks had a bit of a schlep up the hill. WiFi was ok and ATT was good. Old Santa Fe is a very picturesque and historic place to visit…and it appeared that everyone else thought so too. Crowded with tourists and very hard to find parking. Very nice restaurants, but very long waits (45-60min) for tables. Lots of NM shops offering Indian trinkets and chili spices. Some signs at the last intersection by the gas station would have been helpful. It appears you're driving into a neighborhood. With a 44ft MH + tow, we didn't want to end up in a place that we couldn't get out of. Once arriving at the RV park, there were no signs for where to park when checking in. One person in the office was helpful, the other lady wouldn't get up from her seat to help me. We had a reservation. Our view was of the underside & back of solar panels. The other side was of the top of condos & their a/c units. Most of the spots were barely long enough for the Class A's (tows were parked at an angle or cross ways in front of the coach) & very narrow. It is on a hill & windy, so using an awing is impossible. We had LOTS of ants/ant hills on our site. They got into our coach. We had to use spray to keep them out, spraying inside as as well as water hose & electric hookup. We informed the desk & were told maintenance would spread some pellets. Never happened & left after 2nd night. The park looked tired & in need of TLC. We had expected more from reviews & other campers. I agree with other reviews that this is pricey considering it's about 25 minutes from Santa Fe & basically no amenities. We will look elsewhere if in the area again. This review probably won’t be published, but here goes anyways: The site they assigned me would make a Billy goat happy, but not an RVer. It was not level in any way shape or form, in fact I had issues with my appliances. The other sites had concrete, mine had stone and patio blocks that had seen better days. The laundry room only takes credit cards and had very limited machines with several broken at the time I was here. The dog park was ok I guess if you like to pick up other people’s poop as it was not very well patrolled for landmines. No cable and hookups were kind of a joke at least at my site. About the only good thing to say is that the Wi-Fi was decent (well it was until I tried to access the review pages on the Good Sam site). All in all, I would not recommend this site or stay here again if in the area. Amazing RV park, wish we could have stayed longer. Every site has views. The park is very well maintained with clean restrooms, large sites, trails, common areas, and metal art work everywhere. You can tell the owners take pride in their park. Great campsite with wide spaces easy access helpful staff clean restrooms. Second time here, first going to Calif, second on the return trip. One of the best bathrooms we've ever visited. The grounds are well-kept and trails have lots to look at. We felt safe in this campground. Close enough to Santa Fe to warrant staying at least 2 nights, if you can. Sites near the office seem a little close to one another, so book one over on the East side of the park for the best out of the bunch. Nice place. The park is very clean and quiet. The restrooms are well maintained. Walking trails are available. No shopping/restaurants within walking distance (we are a truck camper and inconvenient to remove camper for a one night stay). Due to an accident on the I40 West of Albuquerque, we arrived to the park 4 hours later than we planned. We had already received 2 phone calls from the park confirming our arrival, this despite an emailed confirmation with a credit card from February 2017. We we drove up after the office in the park had closed. We found, as we we were told, that instructions for getting into the site, would be posted on the office door. We found out that the park had put us in an overflow lot with nothing but 110 power-not the site that we had reserved. We noted that there were other late arrivals and those instructions all had site numbers included. When we checked in to the office the next morning they told us that we had been double booked and basically did not have a site. After the front desk made some frantic calls, a pull through site (which we reserved in February) was found. This should have all gone way smoother than it did. Not very happy. We finally made it to Santa Fe Skies RV park, after a snow delay in late April 2017, and they were very accommodating . We arrived on Tuesday, May 2, and found that they have Argentine Tango lessons in the clubhouse on Tuesday and Thursday nights. My sweetheart has seen Argentine Tango in Buenos Aires, Argentina, so I knew she would enjoy the experience. It was all we had hoped for and more. The owner, a professional teacher, and other experienced volunteers were very patient with us both, and we had a wonderful time. We will be back for more. We have stayed at this resort in the past. It has great views of the Santa Fe valley, but the resort is nothing special and a little expensive for what you get. On this trip we were traveling north from Arizona and called about three hours out around 1100am to check on availability. Our call went to voicemail so we left a message. Two hours later, we called again, left another message. Since it was a Thursday, we drove to the resort hoping to be able to stay three nights. When my wife went into the office, the fella behind the desk said they were full. OK, we didn't have reservations, so not having space was OK, but when my wife mentioned her two calls he said he was too busy to answer the phone and return calls. The customer standing in line behind my wife had the same reaction as she did. How can you run a 4.5 star resort with that attitude. We left. Someone finally did return our call much later in the afternoon. While calmly explaining the situation and our frustration to the lady she handed our call off to the manager. While my wife was explaining the situation to the manager, the manager became defensive, rude, and eventually hung up on my wife. This type of behavior is unacceptable for a resort with this rating. In the end, we found a better, more centrally located, shaded resort for our three nights in Santa Fe. Easy access and spotless restrooms with (can you believe it) great wall paintings in the mens' side. They try oh, so hard and it is a welcome place to view the Santa Fe sunsets. This is a great stopover place and out of the hustle of the city. Great spot, thought fairly expensive for not being that close to town: Full hook ups. Back in spot saved us $2/night. Around $44 w/ Goodsam. Gravel sites, level. Clean facilities.. 5 laundry machines (2 were broken at the time). Propane filling on site. Easy making a reservation by phone. No deposit required. Was pretty full even late in the season. They have a ton of solar panels and offset about 50% of their energy. Not great wifi, but usable. A fine park; but not a luxury RV resort. Nice sites with a nice view. Not right in town, but convenient enough for easy access with a tow vehicle. Be advised we had 2 mountain bikes stolen from our site. They were locked to our RV with 3 steel cable OnGuard locks. The cables were cut with very strong (clearly planned and plotted) cable cutters. Our neighbor also had their bike stolen off the rack from their pickup. This happened in the middle of the night while I was asleep inside our RV. The police indicated that it is, in fact, unusual to have problems in this park, but it happened to us. The management was clearly and appropriately disturbed by the incident; though they took no particular action. There are no security cameras or gate to keep non-guests out of the park. There is a lot of traffic in and out of this park during the day and early evening. This definitely impacted our overall rating and particularly our 'appeal' rating. Unfortunately, we will not be back. Very friendly park. Check-in process was very good. Best park I know of in Santa Fe. Location is just off I25 and close to the Railrunner (if you want to use this to go into town or to Albuquerque). Good wifi, clean, walking trails all around the park for you and your pets. Lots of cute rabbits in the park, too. Would love to have more grassy areas, but that is probably not available in Santa Fe. My family of four met my father and his wife at this park and spent a week as a family vacation, he in his class A and us in our travel trailer. I grew up in Albuquerque, and like to go back when I can to visit, but there are not many nice stays in ABQ. Santa Fe Skies is in a beautiful spot. The management and staff were really nice. We made good use of the courtyard, the grills, one of the owners spent an evening having a beer with us and chatting. The views of the Sangre's and the Jemez from our campsite were awesome. The Sandia's were visible to the south in several spots. Stunning sunsets, decent wifi (for a park) and full hookups. We will be back over and over. What a great place. Clean, modern with great skyline views. Interesting reviews, some great some not, so here's my take. Spent 3 nights here. Is it pricey, hmmm, maybe depends on your pocket book, but I would rather pay a little extra so as not to be crammed in with other RVs and worry about low-lifes stealing my stuff. The sites are spacious in my opinion. So, it seems to me that the site you stay in has a lot to do with how well you like it here. We stayed in the pull thru section site M4 and we loved it. Is there a dead animal smell? Well I didn't smell anything but my wife did mention something like that, I thought it must be the next door neighbor's sewer line. Restrooms and showers are clean. There are many more showers than I've seen at other parks. Ah but the WiFi, yes I agree it's very bad. That is one improvement they could certainly make. In this day and age when equipment is so cheap, not sure why they have not improved it. The park is on a ridge, pro: nice sunsets, con: windy. Is it always windy here? Don't know but it was windy in Winslow, Gallup and here, something about this part of the country in July? The park is about 20-30 minutes from the downtown area where all the artsy fartsy stuff is. Is that a con? Not for me, but some might find it inconvenient. Would I stay here again? Yes definitely. This RV park was a huge disappointment. Sights are not level, the park has zero curve appeal and the sights are narrow. We has to request a different sight as we could not get our slides out without hitting a pole or the neighbors. Also, the place smelled like a dead animal. We booked three nights and left after one. I fail to understand why people like this RV park. What a fantastic place to stay! The owner, her son and staff were terrific. The setting is amazing. The sites are clean, the bathrooms are immaculate, no joke. Great place to stay and sunset pictures are easy to get. I'd definitely stay at Santa Fe Skies RV Park again. Mgmt staff is courteous, friendly, and helpful. Site had good 50 amp 120V power, good WIFI signal, but no cable tv. Bathhouse and showers were immaculate with beautiful 18" terra cotta tile throughout; very nice and spacious. RV park is convenient to shopping and restaurants, but quite a ways from the San Miguel Church, Loretto Chapel, and The Plaza. Extensive road construction and traffic delays occur from the 3600 block of Cerritos Road north for about a mile. From the RV Park, the quickest route to get to The Plaza is the by-pass NM Hwy 599 to St Francis St, then, follow the signs to downtown and The Plaza. We like to stay here as we travel to Santa Fe for family and going from our summer home to our winter home. Sites are large, long and level. Office personnel are great to all. Would not stay at any other park in the area. Of all the RV parks we have stayed in across the country, this is our favorite. The sunsets alone are reason enough, but there is also so much more! The place is immaculate, and there are sculptures all over the property--very much in line with the feel of Santa Fe. The place is run by a family who are all really helpful and knowledgeable about the park and the surrounding areas. We enjoyed a concert on the patio one evening by a duo who were staying at the park--a perfect way to end a day. 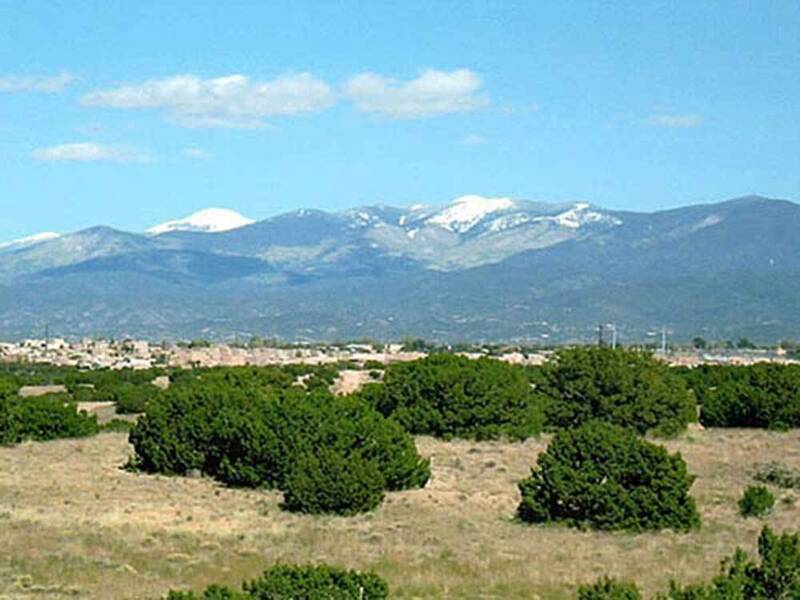 Positives: This RV Park is located on a hilltop setting on the south edge of Santa Fe and close to Hwy 14 and Interstate 25. This is a busy park with lots of rigs pulling in and out each day, but still has a quiet atmosphere with a good visibility of the New Mexican countryside. The Office area is generally central to the park and has co-located toilets, showers, laundry, and club house. All are in very good condition. Many lots are pull thru and most have a nice patio area. A number of sites also have trees. Sunsets were often lovely from the Park’s hilltop location. 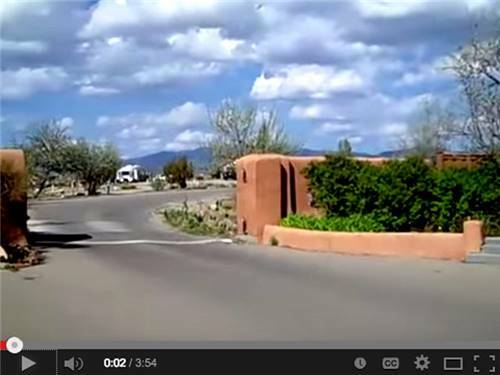 The office has a weekly newsletter which is informative on happenings in the Santa Fe area. Negatives: This RV Park is expensive, ‘in the writer’s opinion’. One month from early Sept to early Oct, during the start of the Albuquerque International Balloon Fiesta, was over $700, though this did include electricity. 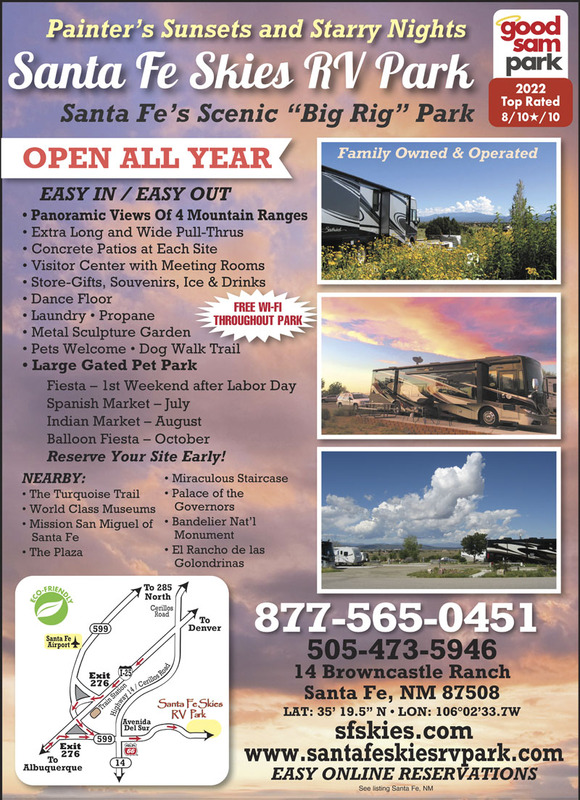 Further south in New Mexico you one RV Park provides indoor swimming pool, hot tub, private shower rooms, pickleball, and a number of social functions, etc. for under $300, so I assume the Santa Fe location is everything. The wireless Internet service at Santa Fe Skies was terrible. My wife and I spent a lot of time each day re-entering passwords and waiting for the wireless connection to reestablish only to get disconnected again and again, always falling back to 3G which used up our phones’ Internet download monthly limit. Staff understood and offered a wireless booster, which made only a 5-10% improvement occasionally. The wireless broadcast antenna for our area of the Park was connected to a site’s electric box and got turned off often as rigs were puled in and out of this site. Once this information was divulged, I went over and put duct tape over the wireless antenna's breaker to stop this from continuing. The only reliable wireless was at the Office block. The whole experience was very frustrating and very disappointing. They said they could make improvements in the wireless signal in our area of the park, but don't know if or when this will be followed through. The Club House was seldom used and the event newsletter often didn’t list the few events that did go on. Conclusion – would we good back? No – due to the high price, lack of facilities, and poor wireless service. We stayed at this RV park 09/20 thru 10/3 due to a tow vehicle breakdown and were very comfortable (felt "safe") the entire time. The owners exhibited a lot of pride in their business and it showed in their friendliness to customers and their pride in the facilities. It was well maintained and very clean at all times and any time we had a question, they were super helpful. It is a very good destination RV park to be used s a "hub" for activities and a comforting place for an overnight stay while "movin' on". Santa Fe Skies is a very nice RV Park. Excellent washroom and laundry facilities. We stayed for a week while exploring the Santa Fe area. Two items of note that could be improved. You are expected to find your site on your own. Some of the back-in sites are tricky and could use the help of a camp host to guide the bigger rigs. The WIFI services are very inconsistent, even at the office.